Golf Carts on the streets in Colonial Beach, Virginia. 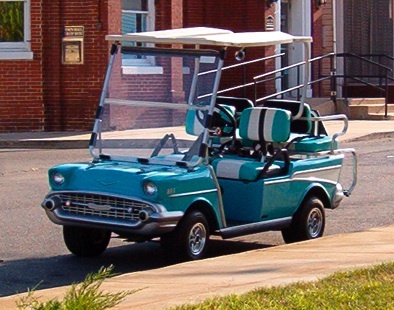 Colonial Beach became the first town in Virginia to allow golf carts on public streets for use other than riding around on the paths at a course. They are a great way to get around the area and it is easy to find parking because they are compact. These fun vehicles used to be rented for many years from Metro on Washington Avenue but that building was sold and is now River Gym. Custom Cartz and the Beach Service Center, both on Colonial Avenue rent them currently. They can run on either gasoline or electric power and can be outfitted with zippered doors in the colder months. 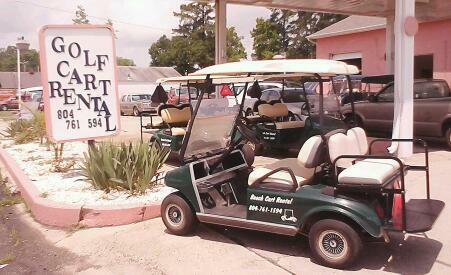 There are many custom-made carts in our area. Some are made to look like miniature vehicles, some have colorful wraps and there are annual parades to show them off. They must be operated by a person with a valid driver’s license. King George County (the next County over from us) wanted them in their area too! On August 1, 2006 they discussed the topic in a Board of Supervisors Meeting and one representative spoke about how there have been no problems with their use in Colonial Beach in the years that these vehicles have been permitted there. SB165 was signed by the Governor on March 7, 2008. It allows golf carts and utility vehicles to cross highways in the Town of Colonial Beach at intersections controlled by traffic lights - if the posted speed limit on the highway is no more than 35 miles per hour. Their bigger, beefier cousins, known as side-by-sides or UTV's have been gaining popularity at the beach as well. The Can-Am Defender is a popular model, as are the Kawasaki Teryx, Polaris RZR and the Yamaha YZX1000R. These primarily off-road vehicles can carry up to four passengers and have a slew of upgrades and aftermarket options available, just like their smaller counterparts.